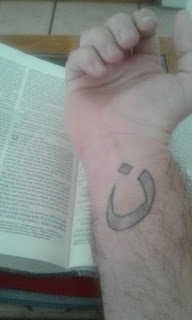 I have a tattoo of the Arabic letter nun on my right wrist and I get asked about its meaning all of the time, especially from Muslims who instantly recognize the symbol and are curious about it. So a year and a half after getting it I have decided to write about its meaning if only to help me to offer a coherent response to others the next time someone inquires about it again. Before I start, if you think that Christians should not get tattoos then you can read another post on that topic by clicking over here. If we are good to go, the letter nun is the equivalent of the English letter n and is the first letter of the word nasrani. Nasrani is what Christians are called in Iraq (it directly translates as Nazarenes) and the symbol was originally used by ISIS to identify Christians in the Mosul area. The ultimatum for these Christians was to either leave Iraq, convert or be killed. A mark that was originally meant to bring shame however has since become a symbol for the persecuted church and a call for Christians around the world to stand with and pray for those who are enduring suffering. According to some reports, some sympathetic Muslims have also joined in a show of solidarity with the ‘We are N’ movement holding leaflets stating, ‘I am Iraqi, I am Christian’, or marking themselves with the symbol as well. On a popular level, the symbol represents the idea of rejecting injustice and showing respect to one another. It is also a reminder to pray for those who are been persecuted and even killed for their faith. On a personal level though, the symbol speaks to me of the cross of Christ in a more powerful way than an image of an actual crucifix would. Today the crucifix image can be seeing on half of Hollywood’s celebrities from Miley Cyrus to Ozzy Osbourne, it has become fashionable and devoid of any power. But the nun speaks of following Christ not just in life but even when the threat of death is real. It reminds us that Jesus conquered not by killing but by dying, violence begets violence but good overcomes evil. Every time I see it, I think of Matthew 5, I thin of Romans 12 and of the book of Revelation, I think of the believers in the persecuted church all over the world and I am encouraged by their witness. The Kingdom of God does not advance when it flexes its muscles but only when it opens its heart and responds with love in kindness and service to others. I am thankful that I live in a land where I do not need to fear for my children because of our theology, I do not have a persecution complex. But I am challenged to live out The Way in the smaller areas of my everyday life. Whether it is helping others financially even though we cannot really afford it or helping someone with a task when it is not convenient or just being nice to someone when it is not reciprocated. There is an abundance of ways to live sacrificially in the service of others. In short then, the symbol on my wrist reminds me of Christ and of a better way of living. 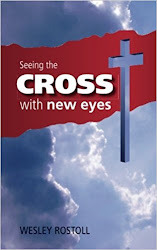 The Cross: Substitution or identification?